Hillary Berman believes that to succeed in small business, a good idea and an entrepreneurial spirit are just the beginning. Working in and for small businesses and start-ups over the course of her career, Hillary noticed a common theme – while small business owners are incredibly passionate and knowledgeable about their businesses, they’re not marketers. Yet in small business, everyone needs to be both a marketer and in sales. She and her team at Popcorn & Ice Cream help. In just two years, they’ve worked with more than two dozen clients to better engage with customers, raise their profiles and grow their revenues. 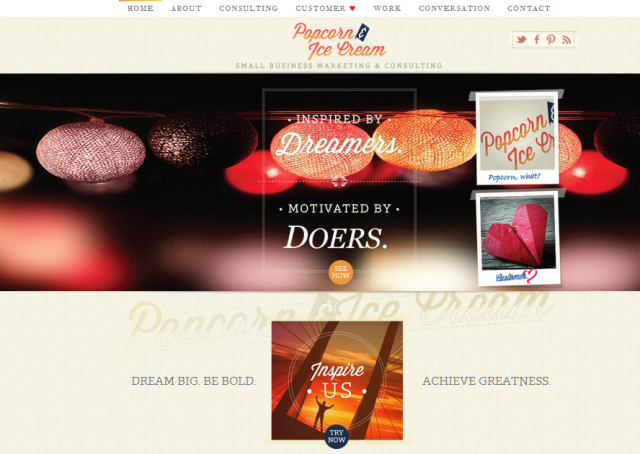 Popcorn & Ice Cream leverages a network of talented marketing professionals under Hillary Berman’s guidance. Hillary brings experience working in and for businesses of varying size to her small business clients. Cutting her teeth on Madison Avenue, Hillary got her first taste of small business at a dot.com reminiscent of Facebook, but sadly before its time. Upon moving back to Washington, DC, Hillary worked for a start-up technology company before turning back to the agency world where she supported both FORTUNE 500 and small businesses alike. Prior to launching Popcorn & Ice Cream, Hillary worked with her husband to build and grow a financial services business. MO: What inspired you to launch Popcorn & Ice Cream instead of working for an established firm? Hillary: When my husband founded his business eight years ago, I tried to help him hire a marketing consultant to assist him with branding and marketing strategy. I came up empty. All of the options were either too tactical or too large in scope for the needs of his small business. That’s what inspired Popcorn & Ice Cream, a desire to make marketing strategy and program execution available to small businesses— at a price they can afford and with a scale appropriate for their size. MO: What are some of the most common marketing mistakes you see clients making and how can they be avoided? Hillary: Almost all marketing mistakes stem from one fundamental problem – failure to consider the customer. When campaigns yield little result or communications fall flat, companies should first look in the mirror. Ask yourself, what value did the marketing program provide my customer? More often than not, marketing that proves ineffective is too self-serving, too complicated or lacks a clear desired outcome. When evaluating marketing opportunities, companies should consider if the program supports overall business objectives and what value it offers from a customer engagement standpoint. MO: How can a fledgling company with a small following start engaging with their growing customer base? What are some ways to keep the message authentic and consistent when resources and time can be so limited? Hillary: Customers are small businesses’ greatest asset. No matter your business, you have competition. Ensure your customers remain yours. Utilize mass communications to stay top-of-mind. Be creative in these – there are so many clever ways to communicate beyond the email newsletter. And implement a one-on-one communications program to demonstrate appreciation for customers’ business and support. Recognize referrals. Hand-written thank you notes go a long way. Most importantly, pursue only those programs and opportunities which support the business objectives. Flashy one-time campaigns for their own sake never resonate with customers or help the business. MO: What are your top tips when it comes to developing a social media strategy? #1: Pick the platforms that make sense for your business. You don’t have to be everywhere. Consider where your customers are and which platforms support your overall marketing objectives. #2: Develop and utilize a content calendar. By planning your posts, you’ll be well-equipped to have relevant content on a consistent basis. #3: Stay on top of it! The greatest value of social media comes from engagement. Scheduling posts in advance is great, but connecting with followers is better. #4: Don’t over-promote. Your profile is more than just an online billboard. Social media is about engagement and sharing – not shameless self-promotion. Provide value to followers in your posts. MO: What are some trends in marketing that you’re excited about or think that our readers should be paying attention to? Hillary: Content, content, content. Everywhere you turn these days, there’s someone else talking about content marketing. I agree, content is king and will be for the foreseeable future. But to me, it’s about good content. Create content that is pertinent to your brand and valuable to your readers. Share it in places that make sense for your existing customers and those you want to have. And use your content to engage, not to preach. In today’s connected world, we’re inundated with truly editorial content, marketing messages guised as content, opinion pieces and blogs, news – the list goes on. To cut through the clutter, you have to stand out and be relevant. MO: Can you talk about the inspiration behind your soon to launch online education program aimed at helping small businesses market in a more customer-friendly way? Hillary: Our goal is to help small business owners effectively market so they can grow their businesses. In working with our clients, we see a common theme – failure to connect with customers. Be it through ill-executed promotional campaigns, self-serving communications, complicated pricing strategies, or difficult purchasing platforms, small businesses often struggle to establish meaningful relationships. Customer ♥ seeks to help – providing training for business owners across the country on how to put the customer at the center of their marketing. Participants won’t leave with a top 10 list of must-do programs. Rather, they’ll receive practical strategies that can reshape the way they view their business and all marketing decisions.